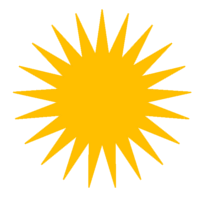 Yazdanism is a term (derived from Kurdish yazdān "divinity", "worthy of worship") introduced by Mehrdad Izady to define the "pre-Islamic native religions of the Kurds", split today in the denominations of Yazidism, Yarsanism, and Ishikism (Alevism). These religions continue the theology of Mesopotamian religions under a Zoroastrian influence, and expressed through an Arabic and Persianate Sufi lexicon. In Yazdani theologies, an absolute transcendental God (Hâk or Haq) encompasses the whole universe. He binds together the cosmos with his essence, and manifests as the heft sirr (the "Heptad", "Seven Mysteries", "Seven Angels" or "Seven Gods"), who sustain universal life and can incarnate in persons, bâbâ ("Gates" or "Avatar"). These seven emanations are comparable to the seven Anunnaki aspects of Anu of ancient Mesopotamian theology, and they include Melek Taus (the "Peacock Angel" or "King") who is the same as the ancient god Dumuzi son of Enki and the main deity in Yazidi theology, and Shaykh Shams al-Din, "the sun of the faith", who is Mithra. Izady states that the Yazdani faiths were the primary religion of the inhabitants of the Zagros Mountains, including Kurds, until their progressive Islamization in the 10th century. The three traditions subsumed under the term Yazdânism are primarily practiced in relatively isolated communities, from Khurasan to Anatolia and southern Iran. One of the few ancient sources that mention the Yazdanis is the Dabestân-e Madâheb, which was written between 1645 and 1658. But according to this source, the Yazdanis, who were also called "Sipâsîâns", were primarily Persians, as they are mentioned in the section regarding the "Parsian". The anonymous author of the source gives an account of their beliefs. It seems, therefore, that the term, at least in medieval times, was used for many other non-Islamic faiths whose ideologies revolved around angels and a luminous being. Yazdânism teaches the cyclic nature of the world with reincarnation of the deity and of people being a common feature, traversing incarnations of the soul of a man into human form or an animal or even a plant. There are seven cycles to the life of this universe. Six of these have already happened, while the seventh one is to yet unfold. In each cycle, there is a set of six reincarnated persons (one female, five male) who will herald the new cycle and preside over it (the seventh one in the set being the ever-lasting, the ever-present Almighty). The reincarnation of the deity could be in one of the three forms: a "reflection incarnation", a "guest incarnation", or the highest form, an "embodiment incarnation". Jesus, Ali and the three leaders of the three primary branches of Yazdânism are all embodiment incarnations, meaning Godhead actually born in a human body, not different from the Christian belief in the divine birth of Jesus as "God the Son." The principal feature of Yazdânism is the belief in seven benevolent divine beings that defend the world from an equal number of malign entities. While this concept exist in its purest form in Yârsânism and Yazidism, it evolves into "seven saints"/spiritual persons, which are called "Yedi Ulu Ozan" in Chinarism (Ishik Alevism). Another important feature of the religions is a doctrine of reincarnation. The belief in reincarnation has been documented among the Nusayri (Shamsi Alawites) as well. The Yazidis believe in a single God as creator of the world, which he has placed under the care of these seven "holy beings" or angels, the "chief" (archangel) of whom is Melek Taus, the "Peacock Angel." The Peacock Angel, as world-ruler, causes both good and bad to befall individuals, and this ambivalent character is reflected in myths of his own temporary fall from God's favor, before his remorseful tears extinguished the fires of his hellish prison and he was reconciled with God. This belief builds on Sufi mystical reflections on the angel Iblis, who proudly refused to violate monotheism by worshipping Adam and Eve despite God's express command to do so. Because of this connection to the Sufi Iblis tradition, some followers of other monotheistic religions of the region equate the Peacock Angel with their own unredeemed evil spirit Satan, which has incited centuries of persecution of the Yazidis as "devil worshippers." Persecution of Yazidis has continued in their home communities within the borders of modern Iraq, under both Saddam Hussein and fundamentalist Sunni Muslim revolutionaries. In August 2014 the Yazidis were targeted by the Islamic State of Iraq and the Levant, or ISIS, in its campaign to "purify" Iraq and neighboring countries of non-Islamic influences. Yazdânis do not maintain any of the requisite five pillars of Islam; nor do they have mosques or frequent them. The Quran to them is as respectable as is the Bible, and yet each denomination of this religion has its own scriptures that the adherents hold in a higher esteem than any one of the former or others. From the Yarsani (sometimes also called Ahl-e Haqq or Yâresân) point of view, the universe is composed of two distinct yet interrelated worlds: the internal (batini) and the external (zahiri), each having its own order and rules. Although humans are only aware of the outer world, their lives are governed according to the rules of the inner world. Among other important pillars of their belief system are that the Divine Essence has successive manifestations in human form (mazhariyyat, derived from zahir) and the belief in transmigration of the soul (or dunaduni in Kurdish). The Yarsani do not observe Muslim rites and rituals. The term haqq (as in Ahl-e Haqq) is often misrepresented and misinterpreted as the Arabic term for "Truth". Instead, its true meaning is clearly explained by the contemporary Avatar of the Spirit in the Yarsani branch of the religion - Nur Ali Elahi (died 1974) - as being "distinct from the Arabic term and in fact, should be written as "Hâq" ("Hâq-i wâqi'") instead of "Haqq" and should be understood to be different in meaning, connotation and essence." There are also large communities of people of Yarsani in some regions of Iranian Azerbaijan. The town of Ilkhichi (İlxıçı), which is located 87 km south west of Tabriz is almost entirely populated by Yarsani. For political reasons, one of which was to create a distinct identity for these communities, they have not been called Goran Kurds since the early 20th century. They are called under the various names, such as Ali-Ilahis and Yarsani. Groups with similar beliefs also exist in Iranian Kurdistan. Interestingly, both the Dersim (Zazaki / Zaza) people and the Gorani, who are both considered to belong to the Hawramani branch of the North West Iranian languages, adhere to a form of "Kurdish Alawi faith" which resembles the religions of the Druze or Yazidi. Yazidis, who have much in common with the followers of Ahl-e Haqq (in western Iran), state that the world created by God was at first a pearl. It remained in this very small and enclosed state for some time (often a magic number such as forty or forty thousand years) before being remade in its current state. During this period the Heptad were called into existence, God made a covenant with them and entrusted the world to them. Besides Tawûsê Melek, members of the Heptad (the Seven), who were called into existence by God at the beginning of all things, include Sheikh ‘Adī ibn Musāfir al-Umawī (Şêx Adî), his companion Şêx Hasan and a group known as the Four Mysteries: Shamsadin, Fakhradin, Sajadin and Naserdin. The adherents of Chinarism/Ishikism (Ishik Alevism), Yârsânism and Yazidism are estimated to constitute about one-third of the Kurds. The main body of the followers of Chinarism/Ishikism, however, are the Anatolian Turkmens and Turks, while in Syria, Lebanon and Israel, they are Arabs. In Iran, the followers of the Yârsân can be as often the Azeris, Persians, and Mazandaranis as Kurds. The adherents of these faiths were referred to as the Sabians of Harran (of Carrhae) in Maimonides Guide for the Perplexed. The Sabians are also mentioned in the Qur'an and in Bahá'í writings. The Ishik Alevis may be found in central and eastern Turkey and northwestern Syria. The Yârsâni or Ahl-e Haqq are located in the eastern (and northeastern) part of Iraq and in western Iran. The Yazidis come from the Turkish-Iraqi border region, and many of them reside in Armenia. Mutual exchange and contacts between these branches are infrequent. Izady proposes the term as denoting a belief system which "predates Islam by millennia" which is in its character "Aryan" rather than "Semitic". The view on non-Islamic identity of the Yazdanis is shared by Mohammad Mokri, the well-known Kurdish folklorist and historian, who states this religion to be "less Islamic than Baha'ism", which had been emerged from Bábism as "a new non-Islamic religion". The most notable case is that of Izady (1992) who, in his eagerness to distance the Ahl-e Haqq from Islam and to give it a purely Kurdish pedigree, asserts their independence from Islam. He fails, however, to produce any evidence at all in support of his theory, and some of his assertions can only be called preposterous. Birgul Acikyildiz. 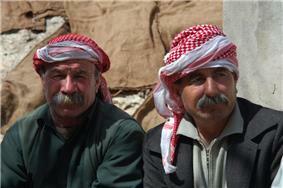 The Yezidis: The History of a Community, Culture and Religion. I. B. Tauris, 2010. Lawrence G. Potter, Gary G. Sick. Iran, Iraq, and the Legacies of War. Palgrave Macmillan, 2004.